And our Friday chef is the multi-talented Allegra McEvedy MBE. Columnist, author and chef-proprietor of small-is-beautiful restaurant Blackfoot in Exmouth Market, Allegra has agreed to join Tim Kelsey in the kitchen at St Catz cook for us on Friday 11th July at the Oxford Symposium this year. Apart from the day-job, she writes on cookery in The Guardian and has made a cookery 6-parter for BBC2. “My dad,” she says in a recent quick-fire interview in The Independent, “Was a consultant psychiatrist by day and historian by night. Our mum had a background in advertising but after having us, turned her hand to lots of things, from running a wine bar to writing radio plays.” Allegra was born in 1970, raised in West London and her academic ambitions were foiled (she wanted to be a barrister) when she was expelled from St Paul’s Girls’ School at the age of 17, shortly after the death of her mother. 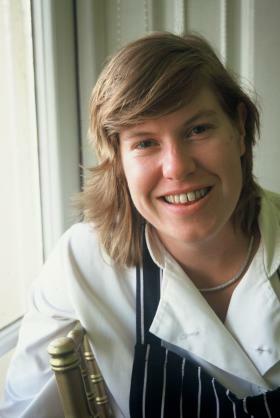 After completing her training in classic French cuisine at the Cordon Bleu in 1991, worked at the Groucho Club, River Café and earned her first head-chefship at Tom Conran’s The Cow in Notting Hill. During a spell in the US, she worked at Rubicon and Jardinière in San Francisco, and ran the kitchen at Robert De Niro’s New York restaurant Tribeca Grill, serving 500 covers a night. In 2003, she launched the healthy fast-food restaurant group, Leon, with Henry Dimbleby and John Vincent, remaining a shareholder but leaving for tv work and writing. Five books – the score so far – include Leon: Ingredients & Recipes (2008), Economy Gastronomy (2009 – from the tv series co-hosted with Paul Merrett); and the latest, Big Table, Busy Kitchen (Quercus 2013). Her popular weekly column has appeared in The Guardian since 2007, and she hosts a live internet “cook-along” with readers every month. This entry was posted in 2014: Food and Markets by Elisabeth Luard. Bookmark the permalink.